These unfortunate phrases have been disemvoweled and squashed together! 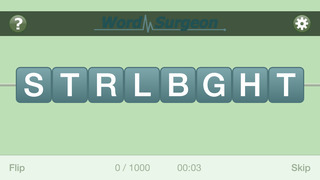 Separate the two words of each phrase by sliding letter tiles up or down. When all of the consonants are aligned correctly, the vowels will automatically appear. • 1000 phrases to solve! • You can never truly get stuck. You can always puzzle it out by grouping likely letter combinations, even if you do not know the phrase. • If all else fails, tap the Skip button. The skipped puzzle will appear again later. • Average solve time and total solve time are tracked on the settings page. • Do timers make you nervous? You can hide the timer from the settings page. 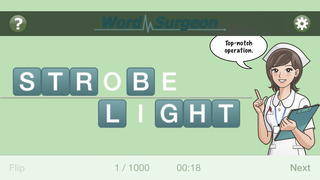 Word Surgeon is an iPhone and iPad educational game in which the player must slide the tiles up and down to fix the disemvoweled phrases. With over 1000 phrases to solve, this app has lots of gameplay to enjoy.